Growing up isn’t always easy. Just as the adult world is fraught with all sorts of competition, whether business related or otherwise, so too is a child’s world full of social obstacles. From a young age each child makes particular friends, which often distinguish him as a part of a social “clique”, at whatever school he attends. Being outside these cliques often subjects a child to bullying, which can be physical and/or verbal. Kids can be very cruel at times and will pressure each other in different ways and not all parents are able to provide their children with the necessary tools to defend themselves against bullies. However, if a child becomes involved in martial arts, such as those offered at Precision MMA in the Hudson Valley, they can learn to take matters into their own hands and become more confident in dealing with bullying and social pressure. When children learn to defend themselves physically they change from the inside out: they become more confident and this confidence shows in the way they hold themselves and conduct themselves daily. The reasons for enrolling ones’ child in martial arts at the Hudson Valley’s Precision MMA are nearly endless, and it’s something every parent should strongly consider. The first thing to consider before enrolling one’s child in a martial arts program, such as those offered by Precision Kid’s MMA in the Hudson valley, is which style the child is interested in. A parent should have his child watch one of the kids’ classes ahead of time and let him choose which class he would like to attend so he feels from the start as though he himself is the one in power. Forcing ones kids to partake in an activity rarely provides the best emotional outcomes, and when the child later sees the progress he has made and remembers that it was he himself who chose to partake, it will make him feel all the more empowered. Once the child has chosen a martial arts class, such as either Boxing, Brazilian Jiu-Jitsu or Muay Thai kickboxing, all are offered by Precision Martial arts in the Hudson Valley, they will see from the start that this sort of training isn’t always easy. In fact, while the training should be fun, it should also be challenging so that the student knows he has accomplished something when he makes it through a difficult class. Especially if started at a young age, the child will be able to see his musculature develop as he grows and this will give him a greater sense of self-confidence. At school his peers will notice the physical changes taking place in him and they will most likely also notice him carrying himself with more confident body posturing as a result of the hard training. This should in general help a young martial arts student from Precision MMA to avoid being the victim of bullying. Kids generally tend to look for their physically weaker classmates to pick on, as well as those who appear to lack in self-confidence, and so young martial artists will not be the greatest choice of victims. As a child grows into his teen years and pressures mount, if he has been doing martial arts for years at an esteemed school, such as Precision MMA in the Hudson Valley, he will at this point be quite confident in his skills to defend himself physically should the need ever arise. Of course, violence is always best avoided at all costs, but that is why martial arts training is all the more effective for preventing bullying, because when one knows how to fight, they are less likely to feel defensive and more likely to stay out of trouble as a consequence. Just as lack of self confidence shows in body posture, and makes a child more likely to be a victim of bullying, so too does lack of self confidence breed defensiveness, and this defensiveness often leads kids to become bullies themselves. If a child or teenager feels that they are lacking in some area they are likely to want to take their frustration out on others and become a physical or verbal bully. Hudson Valley martial arts students gain the confidence necessary through their training to overcome these feelings of defensiveness so they will be just as unlikely to become the school bully, as they are to become a victim of bullying. The constant training in techniques based in real world self defense will give them the peace of mind to know that they can handle physical attack, and so if a bully threatens them, either physically or verbally, they will be more likely to laugh it off than actually engage and risk injury, school expulsion or other consequences. Moreover, martial arts training at Precision Mixed martial arts in Hudson Valley, New York, breeds discipline. Students know that if they want to improve they are going to have to make sacrifices and work diligently. They will see that if they do not properly apply themselves they will not get the results they want and this will likely cross over to other areas of their lives. They may see that if they don’t finish their homework ahead of time they will not have time to attend their martial arts classes, and so as they grow to enjoy them they may learn better time management to get their assignments done early and become better students as a result. And in this way, not only do young Hudson Valley martial artists become more confident because of their physical abilities, but also because of their overall life success. Precision MMA instructors also stress respect for oneself and ones’ peers, so a martial arts’ student at Precision is not likely to victimize or ostracize his classmates or engage in any form of bullying. In addition, Precision in the Hudson Valley often acts as a “home away from home” for many young kids looking for something to do after school or on the weekends. Martial arts training generally keeps kids busy so that they don’t have too much idle time to get into trouble. In summation, bullies tend to stay away from winners, realizing that the other kids who are highly successful will not be the easiest targets. Martial arts training at Precision MMA in the Hudson Valley helps make kids into winners, not only on the mat or in sport competition, but in school and in life as well. Get Your Child Started at Precision Mixed Martial Arts Today! Make sure to ask about our 30-day FREE trial! MMA in the Hudson Valley has been exploding over the past few years. Unfortunately, many of the Hudson Valley MMA Gyms are simply single style martial art schools re-branding themselves in order to profit from the UFC boom. Here’s a few things to look out for when selecting an MMA gym in the Hudson Valley. A true mixed martial arts gym will have golden gloves boxers, muay thai kickboxers, grapplers and mixed martial artists all stepping onto the mat, ring or cage to compete. If you are at a school which only produces kickboxing competitors or grapplers then that is a big red flag. MMA encompasses so many unique styles that its nearly impossible for one coach to be a true expert in each discipline. A well rounded Hudson Valley MMA gym will have a variety of instructors for wrestling, Judo, boxing, muay thai and Brazilian Jiu-Jitsu. If there is only a single instructor then they are likely severely lacking in one or more areas. If 75% of the classes are devoted to one style then you probably are NOT at a true Hudson Valley MMA gym. Many Jiu-jitsu gyms will have a “boxing night”. While that may be a nice change of pace, it certainly does not do enough to qualify the school as a Mixed Martial Arts Gym. Authentic MMA gyms teach in depth in all ranges of combat, not topical highlights. An MMA gym will have a striking area as well as a grappling space. If your gym only has a boxing ring and heavy bags with no grappling mats or crash pads then you can bet they aren’t devoting enough time to ground fighting. Conversely many BJJ gyms posing as MMA schools have nice mats and wall padding but no striking bags or boxing ring. The facility is a reflection of the training. If you want mixed martial arts then you need variety in the facility. 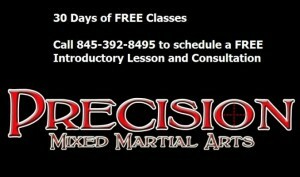 So if you’re looking for an authentic Hudson Valley MMA gym, check out Precision MMA in LaGrange, NY. With classes 7 days a week in boxing, muay thai, BJJ, Judo, Wrestling and Mixed Martial Arts Precision has the best schedule in the Hudson Valley with experts teaching each discipline. We also are the largest MMA school in all of Dutchess County at 5,000 square feet. Precision MMA in the Hudson Valley is taught by MMA fighters for MMA fighters. Since the first Ultimate Fighting Championship in 1993, the sport of Mixed Martial Arts has gone through numerous changes in terms of both rules and mainstream acceptance. Originally, what is now known as MMA was actually a different sport in its structure. In the early days it was known as “Vale Tudo”, which translated from Portuguese means “anything goes”, or otherwise referred to simply as “No Holds Barred fights”. In 2001 however, the New Jersey State Athletic Control Board was the first to adopt a new rule set called the “Unified Rules”. The majority of the United States, including the Hudson Valley region of New York, and the rest of the world quickly adopted these rules. As such, they are now generally accepted as the main set of regulations for the sport and the move that defined the birth of MMA and the death of Vale Tudo. With the transition from Vale Tudo to Mixed Martial Arts more changed than just the rules. The general audience for the sport grew and changed along with the styles of the fighters, extending to the Hudson Valley and well beyond. Once less of a sport and more of a spectacle, with no weight classes, few rules and very little rhyme or reason behind who was permitted to fight in the events, after the inception of the Unified Rules MMA became a very organized athletic competition. Specific weight classes were created to avoid mismatches, and very clear boundaries were set between what was and wasn’t legal. As the rules became clearer, likewise, the strategies for the fighters competing became more honed and Mixed Martial Arts coaches seeking to prepare their fighters for competition discarded what was useless, and zeroed in on what was effective. Competition teams that focused too much on one aspect of MMA and not enough on the others began to fall out of favor as their members were less successful, and the successful teams provided a formula for others to follow. While the strategies for the camps differed, one factor was consistent amongst most: in general, most successful teams, such as Precision MMA in Hudson Valley, New York, had one or more coaches who had at one point fought in Professional Mixed Martial Arts fights themselves. This remains to be the case these days, as MMA fighters need coaches who have also set foot in the ring to clarify details that might be overlooked by instructors lacking this experience. 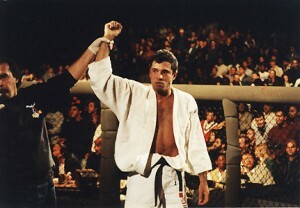 Despite the massive differences in the rule set at the time, when Royce Gracie fought in the first UFCs in the early 90s, he didn’t go out there knowing what to expect based only on his own past experiences. Royce fought with his father Helio and his brothers Rickson and Rorion in his corner, all of whom had fought professionally themselves. Though Royce outmatched most of his opponents, he found his first real challenge when faced with 265lbs wrestler Dan Severn in the main event of UFC 4. If you look back at that old footage you can clearly see moments when Royce is looking to his corner for advice. Royce went on to win the fight, but without his corner this may not have been the case. A good corner man, like those provided by Precision in the Hudson Valley, is essential in MMA and experience in the ring is the most important credential any corner man or instructor can have. There are many reasons for this that we will look at in detail. First and foremost, Mixed Martial Arts is a very chaotic sport. Even with the modern Unified Rules, the possibilities for what can occur in the ring are nearly endless and fighters risk very real bodily injury every time they compete. Anything that can make the sport less chaotic is a plus, and the antidote to chaos is experience. Even if someone cannot relate to an experience themselves, they should at the very least have an advisor who can. At Precision Mixed Martial Arts in Hudson Valley, New York, students are extremely lucky to have an instructor who has been in the ring himself in Brian McLaughlin. 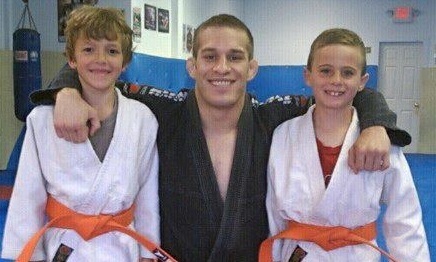 Boasting a record of 6-2 and having fought on the Ultimate Fighter Season Eight, Brian is able to coach his students from a unique vantage point. The Hudson Valley’s McLaughlin has faced just about every adversity in the ring and can explain details that a coach who has not fought would overlook. Sure, any MMA coach can tell his student that as a modern day fighter he will need to be proficient in the standup, wrestling and ground portions of the game. However, only former fighters like Brian can tell you what it is like to fight with an injured hand or with bronchitis. Only a former fighter will be able to tell his students to avoid shooting on the logos of the mat surface in the cage, because these surfaces are much more abrasive than the rest of the mat and will tear the skin of one’s knees. These are just a few details that Precision in the Hudson Valley’s MMA coach can impart to his aspiring fighters. Many Hudson Valley MMA camps are organized mainly around one discipline as their base. For some schools the instructor has a striking background and has competitively taken part in boxing and kickboxing fights. Others come from a wrestling background and others from a Brazilian Jiu-Jitsu base. However, even coaches who have fought or competed under these rules are incapable of fully preparing a student for a mixed fight where the combat can take place both standing and on the ground. An MMA coach who is a former Jiu-Jitsu competitor, for example, may be able to instruct his students to try to keep the fight on the ground, but they will not be able to explain first hand the frustration experienced when the opponent refuses to fight your fight and simply wants to back away to the standing position. A coach with actual MMA experience like the Hudson Valley’s Brian McLaughlin can explain to his students how they may need to be patient in such a situation, because it has in fact happened to him. Likewise, an MMA coach with experience will know that closing the distance against an experienced striker may be difficult or likewise, that keeping the fight standing against a good grappler may not always be possible, and that should the fight hit the ground they will need to have other options. Beyond the strategic factors however, there are also the psychological ones that are even more difficult to grasp for someone who has never themselves fought. Prior to competing, any MMA fighter is bound to be nervous. Not only are they about to fight someone intent upon doing them bodily harm, but an audience is watching. There is going to be a great deal of noise in the arena that may be distracting. The lights may be bright to an abrasive extent and members of the audience may be inebriated or out right insulting to the fighters. A coach or corner man experienced in fighting himself will have specific coping strategies for his fighters when it comes to dealing with these aspects that a coach who has not fought will lack. For example, if the sight of the crowd becomes overwhelming, an MMA coach like the Hudson Valley’s own Brian McLaughlin may recommend that the student look for one individual in the audience who they are familiar with to make the image appear less threatening. This isn’t the sort of tactic any coach could recommend, its one only a former Hudson Valley MMA fighter would think of because he himself had to deal with it. Likewise, a former fighter will be able to explain to his students how to have a poker face while fighting, and how to hold oneself so that one’s own exhaustion or physical pain is less apparent to the opponent. He will also be able to explain how controlling one’s breathing while fighting is important so that they do not become too tense, how to drown out the sound of the audience by listening to one’s corner, or how to keep one’s eyes on the opponent to avoid other distractions. Finally, former MMA competitors like Precision’s coach in the Hudson Valley can explain to their students first hand how to deal with different types of opponents and environments. For instance, if their student is about to fight a skilled wrestler who lacks a varied striking game, the MMA coach may be able to reference a particular fighter he faced with that resemblance and suggest his student try to land a standing blow before initiating an aggressive guard game. If his student is facing a pro boxer, the coach may be able to describe from personal reference how such a fighter might panic once being taken down and the sort of reaction they might be likely to have. MMA coaches like Brian McLaughlin from the Hudson Valley will also be able to explain to their students how fighting in a cage differs from fighting in a ring and how to prepare for each, because they have fought in both environments. They may also have strategic advice for fighting with rounds of different lengths, for example, they may suggest that a student competing with shorter rounds initiate aggressively early in the round, or they may suggest a student fighting with longer rounds play a more conservative game to prepare for the exhaustion of the later rounds. All these aspects and others too numerous to count can only be explained by an MMA coach with actual in-the-ring experience. In the ever-growing sport of MMA new strategies are being developed each day and every school has its own strengths and weaknesses. As every member of a fight camp comes together they combine to form an overall body of knowledge, of which the strongest link is the head instructor. When the MMA instructor himself has fought professionally, like Precision’s coach in the Hudson Valley, there is less guesswork involved in fighter preparation and so the fighters will know more of what to expect when they step into the ring themselves. Study after study has shown that training in martial arts can augment a child’s self-confidence. For many, becoming more certain in one’s own abilities and worth is of critical importance, and martial artists such as Jiu-Jitsu blue blood Rener Gracie have successfully applied their expertise to “bully-proofing” these vulnerable boys and girls. But what about children who aren’t being victimized daily by the school pest? Can kid’s martial arts training benefit them even if they already have average or even high self-esteem? The answer is that of course it can! Children’s martial arts training doesn’t just build inner strength, but actually encourages students to take pride in positive attributes. After all, a child can be self-confident because he thinks of himself as too cool to care about academics or even because he’s a bully himself. What children learn in martial arts gyms on the other hand is that failing school and using unprovoked violence aren’t anything to be proud of. A good martial artist values discipline, respect, perseverance, and humility. She strives for success in mastering math tests with the same enthusiasm with which she tackles belt tests. She treats children outside of the gym with the same dignified consideration that she shows her Precision MMA instructors and fellow students. Honing a skill such as Poughkeepsie Jiu-Jitsu or karate also gives children something concrete to take pride in. Each perfected move and belt promotion is an opportunity for a student to set a goal, practice self-discipline, and reap the benefits of his own hard work. His knowledge of his ability to do this, in turn, will give him confidence to meet challenges in other areas. This aspect of martial arts training is particularly beneficial to young girls and boys because as they enter adolescence and eventually adulthood, they will come across many new, unfamiliar situations. They’ll unfortunately meet people who might criticize them unfairly or call into question their basic worth. Being able to recall not just general praise (“you’re so good at sports!”) but a specific achievement (“I was awarded a black belt because I worked so hard for years towards this goal!”) can give someone the boost they need to persevere in a difficult situation. Poughkeepsie kid’s martial arts training also instills a sense of teamwork. This may seem counter intuitive because martial arts aren’t team sports, but in reality lessons of cooperation are just as easily picked up at a gym as on the soccer field – if not more so. Under the guidance of a competent adult instructor, such as those at Precision MMA, students quickly learn that individual success depends on having a good sparring partner and the willingness of others to helpfully critique one’s weaknesses. The system of belt rankings instills an atmosphere within the gym where students learn from those more advanced than themselves and proudly pass on their knowledge to children with lower-rank belts. And when it comes down to it, few scenes evoke as deep a sense of camaraderie as a group of martial artists from the same gym passionately cheering on their friend during a match. Finally, Poughkeepsie kid’s martial arts training can benefit all children because it promotes physical fitness. Students stand to gain health benefits including better cardiovascular health and a lower risk of heart disease, diabetes, and other diseases down the road. Studies have also shown that unfortunately people who are in good shape (even young boys and girls) tend to be perceived and treated more positively by others. Because restrictive dieting and weight training are inappropriate for children, practicing a sport such as a martial art is uniquely capable of spurring healthy, valuable life-long habits without destructive side effects. The self-confidence gained from training coupled with adult support at home, in school, and at the gym can help children extricate themselves from terrifying, demeaning, or perhaps even dangerous bullying situations. The ability of Poughkeepsie kid’s martial arts to make an impact on the lives of children struggling with mental anguish or physical violence can never be understated. In addition, martial arts training builds positive values, gives children a concrete sense of accomplishment in their own hard work, encourages cooperative competitiveness, and can serve as a foundation for a lifetime of physical health. These benefits are available to all children, including those who are fortunate enough to already have high self-esteem.